Representative Honours: Ireland: 3 Full Caps (1888-1891); Irish FA Repesentative; Co. Londonderry: 4 appearances; Co. Antrim: 3 appearances. Club Honours: (with Limavady) North West Cup Winner 1887/88; (with St. Columb’s Court) North West Cup Runner-Up 1889/90; (with Distillery) Irish League Champion 1895/96; Co. Antrim Shield Runner-Up 1894/95; Charities Cup Runner-Up 1891/92; (with Glentoran) Co. Down Cup Finalist 1892/93 (actual result of Final unknown). * all competitive games; # friendly games; Distillery record for both spells. "Tackles well has good judgement and uses his weight efficiently." Born in the British dominion of Canada, George Forbes settled in Londonderry and began his football career with Limavady, then one of the leading clubs in Irish football. A strong, reliable full-back (either left or right), he tasted North-West Cup success and played in the Irish Cup semi-final (lost 5-3 to Cliftonville), and also won the first of three caps, during the 1887/88, his only season with the club. Forbes spent 1888/89 with the Londonderry-based St Columb's Court, where he played in their 3-1 Irish Cup third round defeat by YMCA. Transferred to Distillery in the spring of 1889, Forbes made his debut on the 22nd April - after the Irish Cup and Co. Antrim Shield had already been won. 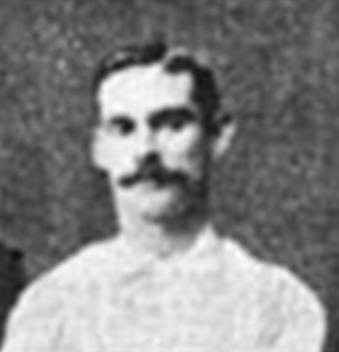 He regained his place in the Ireland side during the 1891 British Championship campaign, slotting in at right-back and left-back against England and Scotland respectively. In October 1891 he scored his one and only competitive goal in Distillery’s 7-0 League defeat of Oldpark. 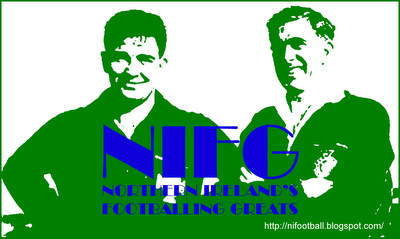 In November 1892 Forbes joined Glentoran, helping his new club to the Co. Down Cup final. With the scores at 1-1, he put through his own goal to give Ulster the game, 2-1. Glentoran appealed the result on two counts, citing fielding of Linfield players by Ulster and the fact that Ulster's linesman was partial to his own team. The Co. Down FA upheld the protest, but it is unclear whether the trophy was eventually awarded, if it was withheld, or if a replay took place. The following season Glentoran were crowned Irish League Champions, but Forbes played just one competitive game all season and re-signed for Distillery in August 1894. He played three games in Distillery's 1895/96 League title winning campaign, but a broken collar-bone, sustained in a 6-2 defeat by Glentoran on 28th September, effectively ended Forbes' playing career. Forbes returned to Londonderry where he turned out occasionally for St Columb’s Court for a couple of seasons before returning to his native Canada. Summary: 3/0. Won 0, Drew 0, Lost 1.